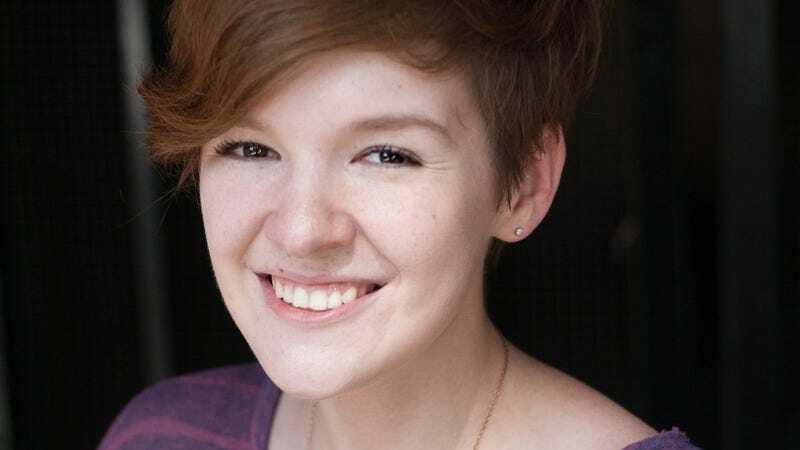 Since she burst onto the comics scene in 2012 with her webcomic Nimona, cartoonist Noelle Stevenson has become one of the fastest rising stars in the industry. Shortly after Nimona’s online debut, book publisher Harper Collins acquired the rights for a high-profile print release, and last year, Stevenson launched the fan-favorite Boom! series Lumberjanes as character designer and co-writer, along with Shannon Watters and Grace Ellis. These two titles have earned the cartoonist multiple 2015 Eisner Award nominations, and her skill for writing teenage characters makes her a great fit for her newest project hitting stands this month: a revival of Marvel’s Runaways as part of the publisher’s Secret Wars summer event. In a recent conversation with The A.V Club, Stevenson talked about the birth of Nimona, the phenomenon of Lumberjanes, and how she’s maintaining the spirit of the classic Runaways run in her new miniseries. The A.V. Club: What was the first comic that had a big impact on you? Noelle Stevenson: I’d say it’s probably Calvin And Hobbes or Spider-Man or Tintin or this weird, old graphic novel picture Bible I had. I didn’t have a whole lot of comics as a kid, but, yeah, I had those. AVC: That sounds like a solid variety, too. NS: Yeah. I think I only had one trade of Tintin and one trade of Spider-Man and then a couple of Calvin And Hobbes. The newspaper funnies, I loved those. AVC: When did you start reading comics regularly? NS: Not too much later. I didn’t get into comics until college and it was sort of an accident. I ended up in a sequential arts class and that’s where I first—I was reading webcomics, but even then, I was very casual about it. But it was around then that I actually started reading comics and seeking out comics. It was an experience for me; I never really saw myself going out of my way to check that out. AVC: What were the big books for you when you were getting into comics? NS: Gosh. I still wasn’t reading anything by Marvel or DC at the time, but I did read Sandman. A friend of mine lent me a bunch of Sandman comics. Is that still technically Vertigo or whatever? NS: That one was kind of my gateway. It was one of several books that came and introduced comics as a storytelling genre to me, at a point where I could recognize the story that it was telling. So it was that, I was reading a bunch of webcomics—Hark! A Vagrant, Gunnerkrigg Court, just all of the big-name webcomics, I was very interested in that. Those were the kinds of stories I hadn’t seen told before anywhere else so I was very interested. It was like webcomics were the “indie comics” that started to pull me at the beginning there. AVC: Was that when you started experimenting with sequential art? How soon after taking that class did you start making your own comics? NS: We started making our own comics for the class, but it was—at the time I was going through a really rough period of my life and I was having a lot of trouble communicating with people. And I was using my art as a way to communicate some of those feelings, but I didn’t necessarily feel like using illustrations was really effective at that or effective in the way that I wanted it to be. So when I took that class and started making comics, something just kind of clicked for me. It was this midpoint, and this marriage of text and illustration was something that was very, very effective for me in communicating and telling stories, and I’d had so much trouble achieving that through other means, through just speech or through just writing or through just illustration and it changed things for me. They were short comics, one- to two-page comics, but it just opened this whole new world of communication for me and I was hooked instantly. AVC: When did you first get the idea for Nimona? NS: I was a junior at school and I had just taken my first comics class, and we were doing an exercise for this other class where we had to create our own characters and Nimona just kind of came out of that. I decided that I liked her so much that I wanted to do a comic with her. So I did a two-page comic of her for my final in that class and I took another comics class the next semester and I did a four-page comic with her, then a 10-page comic with the same characters, and then I was like, “I wanna do this.” I know what the ending is, I want to tell the story. So with encouragement from my teacher, who helped a lot with just refining my process, I decided to do a webcomic. AVC: What did the characters look like in those very first comics, not necessarily just appearance wise? Did their characters change from working on it in class and working on the webcomic? NS: Well the original two-page comic is the actual first two pages of Nimona. So on the website, that’s how they appeared. I did have to go through a sketch process to edit their characters, but I think they’re all pretty close to original concepts to begin with. Nimona always had a kind of punky hairdo and was this tough figure and she wore this dress. Goldenloin always had this flowing, golden hair. Ballister always had—I don’t know if he always had the goatee—but he always had that swept-back dark hair and dark armor. Yeah, they didn’t change too much. AVC: How did Nimona end up at Harper Teens for the print version? NS: I had been posting it online for about a couple of months, I think. It was the summer of 2012, and I was interning at the time in L.A. at Boom! Studios and posting this webcomic at the same time and my agent—the guy who would go on to be my agent—contacted me and he worked at Inkwell Management in New York and had found my webcomic and seen my other work and was interested in representing me and he thought he could sell this. I was very skeptical at first, so I took my parents to go up to New York and visit him in person and make sure that he was the real deal because I figured if anyone was going to be able to tell, it would be my parents. So then I signed with him and I went back to school in the fall and I was still updating my comic and I managed to make it my senior thesis for senior year in school. So I had plenty of time to work on it and while I was doing that, Charlie was laying the groundwork to sell it and we struck a deal with HarperCollins and I think that all happened the first semester of my senior year. AVC: How did that segue into the creation of Lumberjanes? How did you meet Grace Ellis and Shannon Watters and Brooke Allen? NS: Well, I mentioned the internship. I was working as a design intern for Boom! Studios and Shannon was my supervisor/mentor and I had a very close relationship with her and with Boom! Studios and with our editor on Lumberjanes, Dafna [Pleban] and I stayed in touch with them and Shannon started sending work my way. So I did a four-page Adventure Time comic for them, I did covers and then I moved back to L.A. after I finished school in 2013 and it was my first day, my first weekend back in L.A., and I met Shannon for brunch and she pitched me this idea over brunch. And she didn’t even get the words out, I think she got five words into the description of the series and I was like, “Yes. I don’t know what you’re going to ask, but, yes, I want to help out on this. I want to be involved.” So at first, they paid me for character designs and I designed the campers and Rosie and Jen and then Shannon asked me if I’d come on as a co-writer and I said yes, of course. Then everything else, we hired the artists and then it just fell into place from there. AVC: What is the co-writing process like? How do you split the work? NS: I’m writing with Shannon right now on some of the more recent issues and, generally, one of us will run point on each issue, depending on how we decide to divide that up. [Issues] #10 through #12 are supposed to be Shannon’s because Shannon felt very strongly about the story we were telling, so I did the B-story on that one and punched things up and it’s better and I think it reads more cohesively if one person is holding the reins for a story with support from the other party. Then #14 through #17 are a passion project of mine and then on #13, we workshopped it between the two of us and a lot of the brainstorming for that one took place in person and that’s one of the more important parts of writing. Most of the important stuff happens when it’s two people sitting down and workshopping it and going over it and figuring it out. So, yeah, it differs between the individual issue and what writer you’re working with and just whatever ends up working best for you. We try to help each other out and play to each other’s strengths as much as possible, so there are definitely things I will turn over to Shannon and say, “I think you should do this part,” or she’ll do the same for me and, yeah, we just try to be a support system for each other. AVC: You mentioned that when Shannon pitched Lumberjanes to you, you immediately jumped at the opportunity. What was the thing that attracted you to the book? NS: I think the words that she had said before I said yes were probably, “Girl Scout summer camp supernatural mystery monsters.” Those were probably all in there and that’s all I needed to hear. I really love a good adventure-mystery story, an ensemble cast. I am a huge Scooby-Doo fan and I want to see more ensemble casts of girl characters. Then the whole lumberjack vibe of it was also super appealing visually as an artist. So, yeah, there wasn’t anything really not to like and I knew it was going to be a big deal. AVC: What are your main priorities when designing a new character? Do those priorities change depending on the project? NS: Yeah, the process changes for every story because the characters serve different purposes depending on what the story is. So, generally, I have a concept for the character whether I’m designing it for someone else’s concept of a character or building a character of my own. Generally, I start with my own concept, then sketch them out as a way to feel them in a real way. So if I’m doing a team, like in Lumberjanes, I do a lineup to make sure there’s enough variation between characters so that no two characters are running too similar to each other, that they all read separately and strongly. But designing a character for Lumberjanes is going to be different than designing a character for Nimona and is going to be different than designing a character for Runaways. They’re all different stories and different genres as well and there are certainly design elements I go back to a lot, but it depends on the project. With Runaways, I didn’t design the characters, at least not fully. I gave input to Sanford [Greene], who worked his own magic on them and they came out amazing. But even then, as I was brainstorming, I had to draw the characters so that I could feel them in a real way. It’s hard for me to write in a—I have to be able to visualize it. When I’m just a writer on something, I just like to be able to have a feel for what all those characters look like and how they feel and how they interact with each other, so the sketching process really helps me with that. AVC: Why do you think Lumberjanes has developed such a loyal, enthusiastic fan base? NS: Because they’re a really underserved demographic. There aren’t a lot of books out there if you want to read adventure stories. There are more these days than ever before, I think, or at least more visible ones or mainstream ones, but it’s still a very underserved market. Even just the books for kids are underserved as well. There are slim pickings for parents with kids interested in reading stories about girl adventures. There are a few strong contenders, but they’re few and far between and I think that was very clear to us that there was a hole there. So we wanted to help fill that gap. That’s why we’re doing it. We’re writing for and drawing for our younger selves in a lot of ways, the stories that we wished we had at that age. And it’s obviously a passion project and I hope that resonates with readers. I want it to just bring a sense of adventure, and just feeling like the hero in the adventure—the Indiana Jones in your own story, and there’s been so few of those. I think that helps. AVC: How important is it that Lumberjanes maintains a creative team of women? All the fill-in artists are women, which brings a lot of spotlight to people that don’t get as much attention in the male-dominated mainstream comics climate. NS: Yeah, and it’s not like male writers or male artists can’t draw or write female characters, because that’s not true, but at the same time, there are plenty of woman writers or artists out there that aren’t getting employed as much as male writers or artists are and so we want to launch people who might not necessarily be discovered yet by the rest of the comic world. We want to be a place that can raise people up and bring them visibility and we want to be a place for women and gender non-performing people to really have that safe space and do what it is we want to do without trying to appeal to something else, some kind of idea of what comics should be or what comics are supposed to be. And that’s what Lumberjanes is; I think that’s important and what this book is. And, again, it’s not that I don’t think men can’t write as well as girls, because I know that’s not true, but that’s not this book. AVC: You mentioned that you worked out a lot of the flashback issue, #13, in person with Shannon. How much of the girls’ backstories did you know when starting out the book? NS: I think when we were writing the first eight issues, because we thought it was going to be a miniseries, I don’t know what their backstories were. I don’t know if I was told, if it wasn’t finalized yet, but we had character descriptions and I went to draw the character designs, but aside from that I don’t know how much or if that was even planned yet. In eight issues there is only so much you can put in there and it’s a pretty action-packed story, so there’s not a lot of time to really delve into each girl’s personality or family background. So when we were promoted to ongoing, I really felt like we had to double-down what each girl’s background was, what her motivation was, what her hopes and dreams and what made them unique from the others. So me and Shannon went up into the woods and up into the mountains and put things out there. I really wanted to do character studies for each character, so we talked about our ideas for what each character was, where they came from, and then we both went off and wrote these one-page character studies of how each girl arrived at camp. So in that issue, Jo arrives with her dad in this fancy car and in the dialogue it sets up a lot about who she is. The way she sits in her seat, that sets up a lot about her character and I really, really wanted to do that and I was like, “Okay, moving forward, as we’re going to start delving more into these characters and what makes them tick, this is what we need to know.” And then me and Shannon, we each wrote our own versions of that and compared notes later to see how many ideas were similar and what were different and if we could merge them into one and that became #13. So those are basically all of our character studies that we had to pull together with the plot and that became the first day of camp issue. AVC: That was probably my favorite issue. I get such a better idea of who all the characters are just from that little glimpse of the world they’re coming from. And seeing how those first moments of camp are different from the rest of the experience. NS: Yeah. I was writing a Bravest Warriors episode a couple of years back and I was working with Breehn Burns on that, and he said something that really has stuck with me. My episode was all the characters as children, and he was talking about how sometimes when you watch cartoons they show the characters as babies, but they’re the same person—they’re just smaller versions of their grown-up selves. And he was saying that a lot of kids are completely different as children than they are as even a slightly older version of that child, and I’ve been thinking a lot about that. Ripley wasn’t always this ball of energy we all know her as. Around her own family and siblings, it was completely different for her. She was shy and scared on her first day, which you wouldn’t necessarily think after reading any other issues now. I wanted to see the way that was true, and who they were before they knew each other, and the ways they have kind of helped each other grow. AVC: Which Lumberjane do you identify with the most? Who would your teenage self identify with the most? AVC: A few weeks ago, it was announced that 20th Century Fox has optioned Lumberjanes for a movie. I know you probably have no say in what happens, but do you have any hopes for that project? NS: Well, I’m not really going to have a whole lot of input in it creatively. I don’t know how much I can say about it right now, but on our side, the most we can hope for is that it is true to the book even if not necessarily every plot point, and also that it just drives a lot of readers to the book. So, yeah, as long as those two things happen, I think we’re good. AVC: How did you get involved with the new Runaways book? NS: I’m pretty sure it was Nimona. I had just finished Nimona and Wil Moss reached out to me and he’s the editor of Thor and a bunch of Secret Wars books, so he asked me to do a story for the Thor Annual, which I did and it was really fun. But then he asked me if I wanted to take on this, but it wasn’t originally pitched to me as a Runaways book, it was pitched very vaguely as “Dr. Doom’s Hitler Youth.” [Laughs.] So that’s how it was pitched to me, but I was pretty into it. But other than that, it wasn’t super well defined and the characters hadn’t been hatched. I was really allowed to do whatever I wanted to do with it, so it turned into this school situation, this high-school story of a Breakfast Club kind of situation. Then the name Runaways was attached later on, but it did match up with a lot of the plot points I had pitched before I was thinking of Runaways as any kind of reference point. And I think in a lot of ways it did make the story stronger. Molly wasn’t a part of the team before and then they were like, “You have to have one Runaway there,” and I was like, “I’ll take Molly.” She’s been such a fun character to write and she’s been so much fun on the team that I’m really glad that happened. AVC: What is your connection to the original Runaways series? I’m a pretty huge Runaways fanboy, so I’m very excited for the new book. The main thing is that I want a good teen superhero team book, and there are not nearly as many as there could be right now. NS: I think the connection to Runaways is less “How do I reboot Runaways and do the same thing Runaways did?” That, for obvious reasons, wasn’t on my mind at all at first, because that had not been decided yet. But once that became a part of the process, it was really more about how Runaways really struck a chord, and I think a lot of the reason it did was because it was the stories of these teenagers, but they weren’t all that Marvel-y. They were in the Marvel Universe, but they stood on their own; they were kind of in their own little universe in the Marvel world. And there were cameos from other characters, but it was completely its own thing and the character wasn’t about crossing over with Wolverine—even though some of those crossovers happened—it was their relationship to each other and their relationship to their parents. AVC: How did you pick your group of characters for the book? NS: I wanted characters that fit certain archetypes, certain high school archetypes because I really like high school stories. That’s something that happened as an adult. I didn’t actually like high school stories as a high schooler, but I was looking at stuff like The Breakfast Club or different high school movies I’d seen as almost a touchstone there to mash up with other influences. So Jubilee was one I wanted right away, because Jubilee is one of my favorite characters ever. But I was also changing a lot of these characters a lot, too. I change my characters more than I think some of the other series are changing theirs. I’m not really sure; there seem to be differing levels of transformation. But, for example, Cloak and Dagger. I always really liked the look of Cloak and Dagger, so I always wanted them and this duality of that team. But I changed those characters a lot as well. I just switched their powers and made them siblings to see what new things that brought out of them. So, yeah, I kept sending Wil all of these things that I wanted to do. I said, “Could I have Bucky? Could I have Skaar?” I wanted to use these characters and I kept kind of thinking he’d say no, or “You can’t do that” or “That’s too weird,” but he didn’t. [Laughs.] So I just ran with it and tested the limits of what I could actually get away with because it is this kind of event of a story where everything is different. I think I could kind of get away with more things than if it was part of the main canon or anything like that. AVC: It’s one of the really interesting things about Secret Wars. It’s an event where freedom is encouraged instead of the typical event crossover format that restricts the writers by forcing the books into unnecessary tie-ins. The Secret Wars books I’m enjoying the most are the ones that are really out of left field. How did Sanford Greene get involved with Runaways? NS: I’m pretty sure Sanford was attached before I was. So yeah, Wil again, reached out to both of us and united both of us. I saw his art and looked at his portfolio to get a feel for what the book would look like and then I chose characters and designed characters to try and play to his strengths as much as possible. He has this really great energetic look to his art and he really brings these teens alive with that kind of dirt-bagginess. They’re all trying to look really cool in these costumes that they made for themselves and I love that. They’re lanky and tumble-y and I just really dig it. It’s been really cool to see what he does and I’ve never actually worked with an artist whose style is so different than mine. I think Brooke [Allen] on Lumberjanes, you can see more of the lines between my style and hers, but it’s been really cool to work with someone whose style is in a different genre and be able to tell a story that’s also in a different genre. That’s been really cool. AVC: I actually do see some similarities in the body language of your art and Stanford’s. You both are very good with using body language to inform character. NS: He doesn’t stylize the same way I stylize, but because he is so stylized, there’s a thread there where I kind of know what I’m writing whereas if I was writing for someone who generally did really detailed or epic-looking superhero books like Thor. That’s a little bit harder for me to write for because that’s not a visual language I understand as much. AVC: So much of Nimona is about teenage identity and the potential for good and evil, and a big part of the original Runaways is that their parents are evil and they know they have that inside them and they don’t want to live that way. Are we going to see that explored in the new Runaways book? NS: Yeah. The second issue is all that. I think the thing that really sparked my interest from Wil’s pitch at the beginning was that for the kids, they were brainwashed or raised in a certain way to be very cutthroat and aggressive to further the agenda, but they were seeing it, from their perspective, as the ultimate good, the ultimate purpose. For anyone who has been a part of any institution like that—it’s just that second you step outside of something where you thought you knew how things were, and something happens that makes you change your mind and you look around and nothing is the way you thought it was. And that maybe the people that you were viewing as the ultimate authorities, maybe you didn’t believe them anymore. So that was my touchstone for it in a loose way. For me, it was on a much smaller scale, but for these characters, you were raised this way to be what you see as this highest glory and honor and then you realize it’s actually not good and you’re being trained to be a bad person and you’re not okay with that. And maybe the person you thought was looking out for your best interest actually isn’t. So that was the theme that really kind of pulled me in and I saw in that original pitch. So that’s one of the main things I’m playing with in the series. AVC: Were there any lessons you learned working on Nimona that specifically informed your work on Lumberjanes and Runaways? NS: Nimona was basically how I taught myself to do comics. I learned a lot just in the process of making Nimona. In a more specific case, there was a situation where the two lead knights in Nimona, as I was working on it, came to the realization that not only were they former best friends, but they had been romantically involved in the past. And I didn’t really know because I figured that out so late in the game how to incorporate that in to make it feel more natural. And so, then again, when I was brought onto Lumberjanes and we were breaking the first few issues, Mal and Molly were described as having a mutual crush on each other, but no one had really decided how or when that was going to play in and I just really wanted to do that as early possible in that second issue to set that up so that it wasn’t ambiguous and give us a clear place to build to, which was something I kind of didn’t have with Nimona. And then again with Runaways, almost the same theme: How do you set up gay teenagers in a way that feels natural? So I’m still learning those things and those are the lessons you learn by just doing it sometimes. But, yeah, that’s one more specific example, but, in general, you have to figure out what kind of characters you gravitate toward and what stories are fun to write and what kind of scripts and how to format your scripts so the artists have an easier time with it. Yeah, it’s all things you learn and the best way for me to learn things is to do it, to get thrown into something I don’t understand and figure it out from there because that kicks me into hyper-drive. So it’s been a pretty crazy ride, but it’s been fun. AVC: Nimona started out as a webcomic and you’re very vocal on Twitter. How important do you think having a social media presence is for aspiring comics creators nowadays? NS: Social media is basically the entire reason I have a career right now. Like everything: My readership for Nimona came because I was active on Tumblr. I interned with Boom! for the first time because Shannon followed me on Tumblr. Nimona led to Runaways, Nimona led to that Bravest Warriors episode I mentioned, which led to my Disney job that I have now. It’s been crucial to my career and I think it’s one of the easiest ways to build an audience. It’s a lot easier to build an audience now. Okay, I don’t know how to phrase that exactly. I think it’s a tricky thing to say because, on one hand, I’m saying young cartoonists, young writers absolutely take advantage of social media. But also, in another few years, it’s going to be completely different and you can’t necessarily replicate someone else’s career path exactly the way it happened under any circumstances. There could be a whole new website in a few years that completely changes everything again, so I think it’s really about finding new ways to use social media and making it work for you. That’s what I’ve been trying to do. Well, and also, finding ways to be myself and have fun. But I don’t think there are any hard and fast rules that this is what you have to do on social media in order to gain exposure and gain a career and get work. I don’t think that’s true, I think it’s going to be different for everybody. I think technology is changing and growing and the best approach to have is to be self-aware and aware of what’s going on around you and also have some idea of who you are and how to make that ever-changing climate work in your favor. It’s not the easiest skill to learn, but I think that’s a little bit more important than being like “post your art here” or “send your art to this person” or posting it on Twitter and tweeting this person. I just don’t think you can prescribe it in that way. I think there’s a lot more ingenuity that comes into play that every single person, every single individual has to find their own career path in some way on social media. But it’s a great tool. It’s fantastic and it’s changed everything and it will continue to change and continue to affect how creative media is made. It’ll be interesting to see.